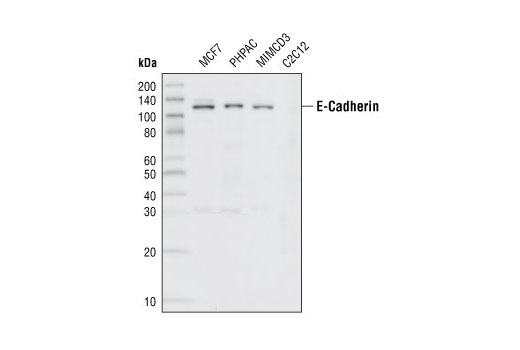 Western blot analysis of extracts from various cell lines, using E-Cadherin (24E10) Rabbit mAb. 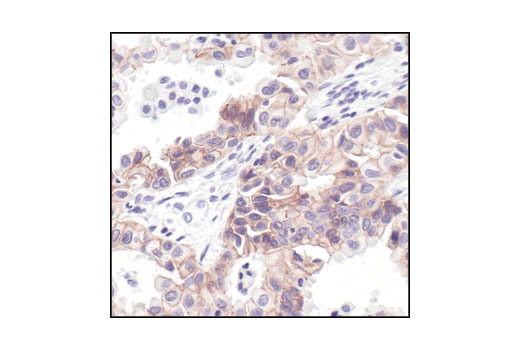 Immunohistochemical analysis of paraffin-embedded human lung carcinoma, using E-Cadherin (24E10) Rabbit mAb. 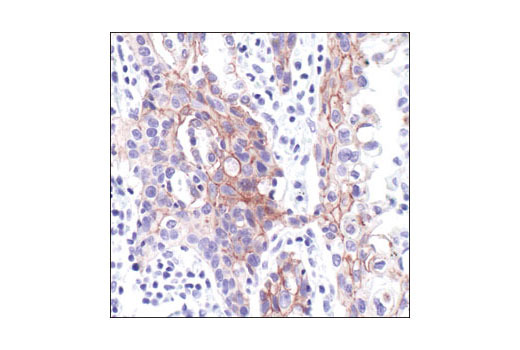 Immunohistochemical analysis of paraffin-embedded human metastatic adenocarcinoma in lymph node, using E-Cadherin (24E10) Rabbit mAb. 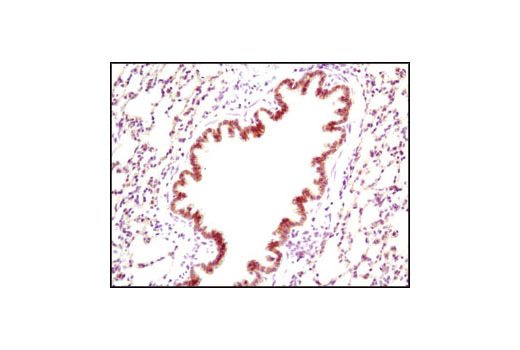 Immunohistochemical analysis of paraffin-embedded mouse lung using E-Cadherin (24E10) Rabbit mAb. 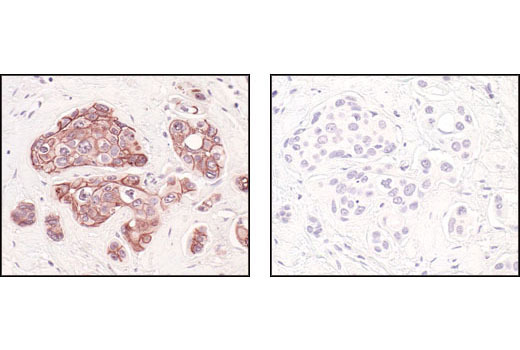 Immunohistochemical analysis of paraffin-embedded human breast carcinoma, using E-Cadherin (24E10) Rabbit mAb in the presence of control peptide (left) or E-Cadherin Blocking Peptide #1050 (right). 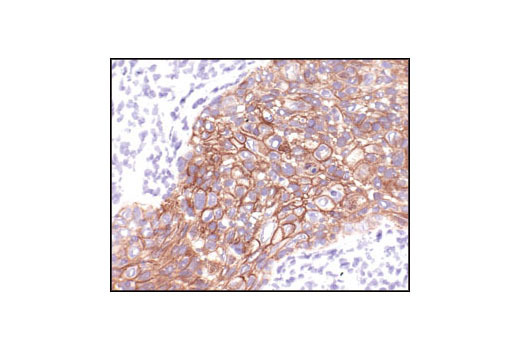 Immunohistochemical analysis of frozen HCC827 xenograft, showing membrane and cytoplasmic localization using E-Cadherin (24E10) Rabbit mAb. 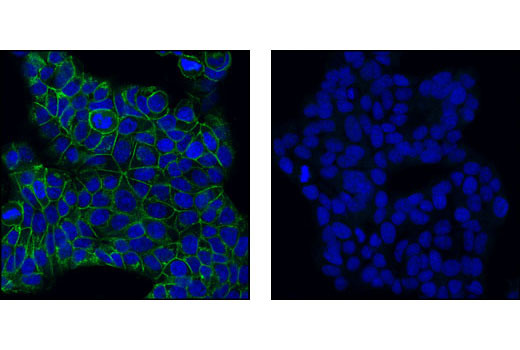 Confocal immunofluorescent images of MCF7 cells using E-Cadherin (24E10) Rabbit mAb (green, left) compared to an isotype control (right). Blue pseudocolor = DRAQ5® (fluorescent DNA dye). Flow cytometric analysis of HeLa cells (blue) and MCF7 cells (green) using E-Cadherin (24E10) Rabbit mAb. 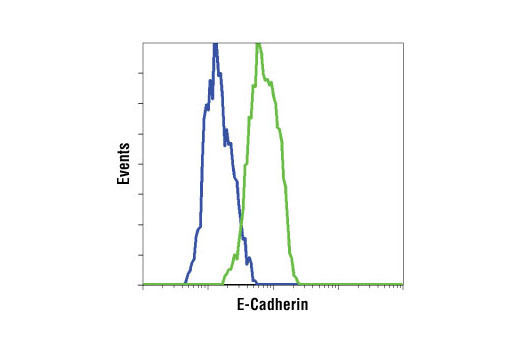 E-Cadherin (24E10) Rabbit mAb detects endogenous levels of total E-cadherin protein. The antibody does not cross-react with related family members, such as N-cadherin.